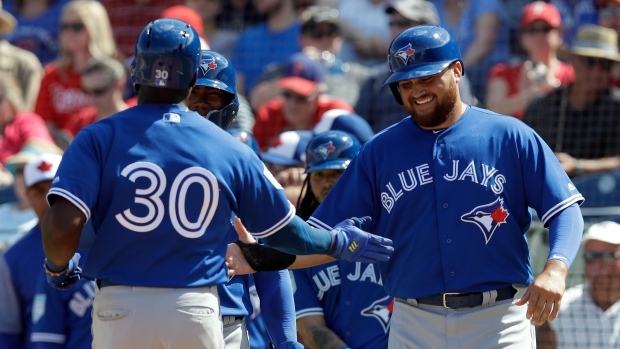 DUNEDIN, Fla. — Rowdy Tellez hit a go-ahead solo blast in the bottom of the eighth inning as the Toronto Blue Jays beat the Minnesota Twins 9-8 on Sunday in pre-season play. Tellez pulled a 1-1 pitch from Ryan Eades over the right-field wall to break an 8-8 tie. Randal Grichuk also went deep in the first inning for the Blue Jays (10-10), who used a five-run third inning to erase an early 4-1 deficit. Starter Aaron Sanchez went three innings, allowing six hits, three earned runs with four strikeouts and a walk. Justin Watts pitched the ninth to earn the save. Grichuk, Cavan Biggio and Luke Maile had two hits apiece for Toronto. Ehire Adrianza had two hits and two RBIs for the Twins (12-10). Lefty Clayton Richard is expected to get the start Monday when the Jays continue spring-season action against the Detroit Tigers (11-10) in Dunedin, Fla.